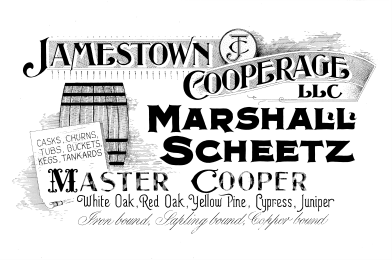 Marshall Scheetz started practicing the cooper's trade in 2002. He completed a six-year apprenticeship under a traditionally-trained master cooper. Scheetz practices tight, dry, and white coopering and creates accurate reproductions of period cooperage including hogsheads, barrels, firkins, butter churns, tubs, piggins, tankards and other coopered containers. Scheetz is an independent scholar researching and documenting the culture and economy of coopers from the 18th and 19th centuries. He collaborates with museums and educational institutions to promote understanding of coopering and coopered containers. Twede, Diana, The Cask Age: The Technology and History of Wooden Barrels, Packaging Technology and Science, 2005; 18; 253-264.